At this stage, it becomes pertinent to ask which factions are present and active in Kobani to push back against IS, besides the PYD’s “People’s Protection Units” (YPG) and Peshmerga fighters brought in from Iraq: that is, the interest here is in which ‘rebel’ factions, if any, are still operating in Kobani. Most broadly, the rebel groups in question fall under the ‘Euphrates Volcano’ umbrella that was announced on 10 September (prior to the major IS assault on Kobani later that month) between the YPG (together with its female wing the YPJ/’Woman’s Protection Units’) and the following claimed select rebel groups to push back against IS in northeast Aleppo province: those groups were named as Liwa al-Tawhid (eastern section), Liwa Thuwar al-Raqqa, Kata’ib Shams al-Shamal of the Dawn of Freedom Brigades coalition, Saraya Jarabulus, Jabhat al-Akrad, Liwa ‘Umana al-Raqqa, Liwa al-Jihad fi Sabeel Allah and Jaysh al-Qasas. 1. We were not consulted about the joint room and for reasons of being alone in the opinion of the region’s leadership. 2. There was no preceding coordination with us and we were not informed of all the details. 3. The lack of existence of an honorary charter detailing all the rights in the area between the commanders. For the record, Liwa al-Jihad fi Sabeel Allah has had and continues to have as a fundamental aim fighting the criminal regime and Baghdadi’s mercenary gang [Da3esh] on all the territories of the region until the realization of victory. 1. We weren’t informed about the issue of the joint operations room and not all the necessary conditions in the region have been fulfilled. 2. We were not made aware of all the details put forward at the joint leadership table in the region; and there was no coordination. 3. And most importantly, lack of existence of an honorary charter detailing all the rights in the area between all the present commanders. Also we have not ceased to be loyal to the revolution and we will remain loyal by God’s permission in steadfast word and deed; and our arms will always be directed against the tyrant Bashar the criminal and his troops and mercenary hirelings from the gangs of Da3esh in every place in our precious land. We can therefore rule out Liwa ‘Umana al-Raqqa and Liwa al-Jihad fi Sabeel Allah as participants in the fight against IS in Kobani. Of the other groups of ‘Euphrates Volcano’, the ones consistently mentioned according to multiple sources as present in Kobani are Kata’ib Shams al-Shamal, Liwa Thuwar al-Raqqa and Jabhat al-Akrad. The last of these three is merely a front group for the Kurdistan Workers Party (PKK), from which the PYD derives, and the YPG to act as a liaison group with the rebels: were the tide of the civil war to turn decisively in the rebels’ favour, one would find that the Jabhat al-Akrad brand would become much more prominent. 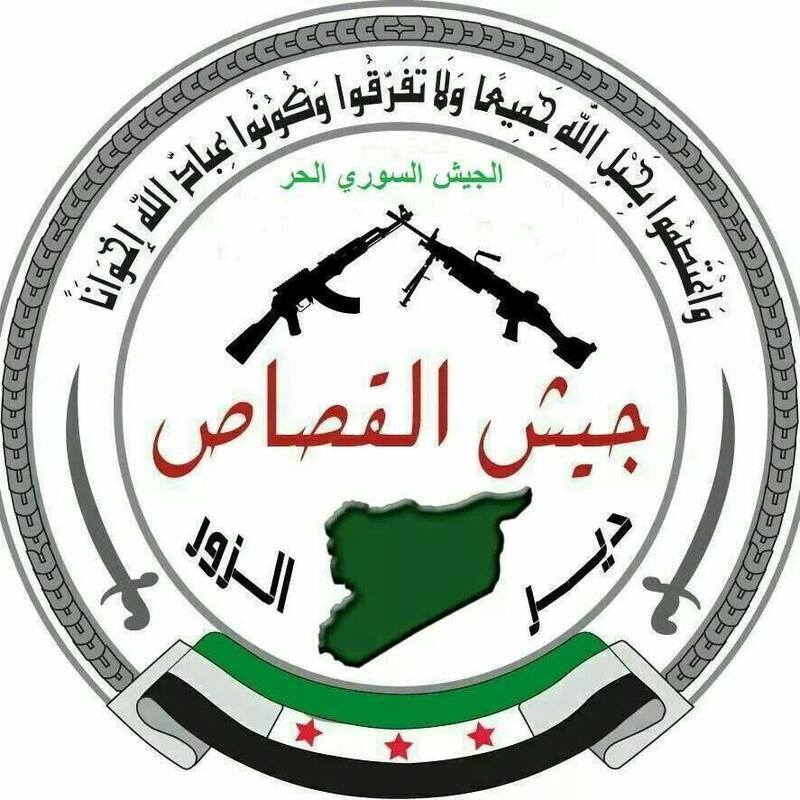 Thus, the two most important rebel groups in Kobani are Kata’ib Shams al-Shamal- part of the Dawn of Freedom coalition that developed out of Liwa al-Tawheed and other local Islamic Front affiliates in north Aleppo province after localities such as Manbij were seized by what was then the Islamic State in Iraq and al-Sham (ISIS) at the start of this year- and Liwa Thuwar al-Raqqa (led by one Abu Eisa), an ex-Jabhat al-Nusra affiliate that had sought out allegiance with Syria’s al-Qa’ida affiliate to protect itself from the encroachments of ISIS during the summer and fall of last year. Liwa Thuwar al-Raqqa tried to move against ISIS in January but ended up being expelled from the city (and from Jabhat al-Nusra), being forced to seek refuge with the YPG to the west of Tel Abyad. Kata’ib Shams al-Shamal leader in Kobani- Abu Layla- with Peshmerga fighters. Photo from Abu Layla himself: 11 November. Clearly having a close working relationship, the combined numbers of Liwa Thuwar al-Raqqa and Kata’ib Shams al-Shamal can be put at 150-250 fighters at most. While one of Dawn of Freedom’s leaders (Abu al-Layth) had put the initial contingent of his own coalition that went to Kobani at 250 fighters, it was notable, as I have mentioned previously, that the numbers steadily went down over time, from 160 fighters in a subsequent conversation down to 70 in an interview with a local representative for Kata’ib Shams al-Shamal. 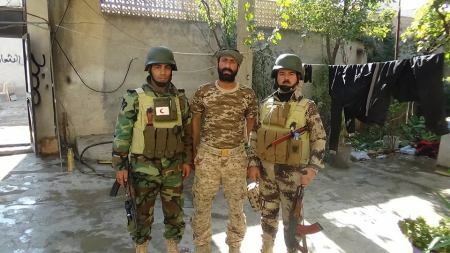 In a later conversation (28 October) with the Kata’ib Shams al-Shamal representative in Kobani, manpower numbers were put at “approximately 180 fighters with all the crews” (“taqrīban 180 muqātilin ma kulli l-ṭawāqim”), likely in reference to the rebel groups working together. Two more rebel factions can be identified as having operated or still operating in Kobani at this point, minor in significance even in comparison with Liwa Thuwar al-Raqqa and Kata’ib Shams al-Shamal. 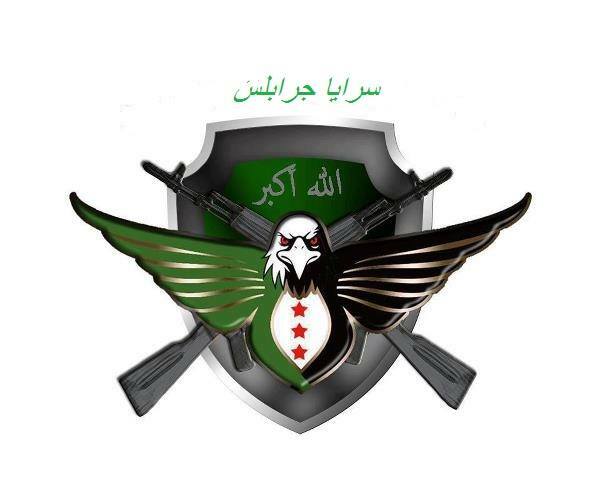 The first of these is Saraya Jarabulus (‘Jarabulus Brigades’), formed out of rebel remnants from the town of Jarabulus which became an ISIS stronghold in June 2013 after being seized from the local rebel group “The Family of Jadir.” Rebels from a number of factions including the Islamic Front tried to take Jarabulus from ISIS in January this year but failed as ISIS regrouped and killed dozens of rebels in the own using a local suicide bomber named Shadi Jassim on 15 January. 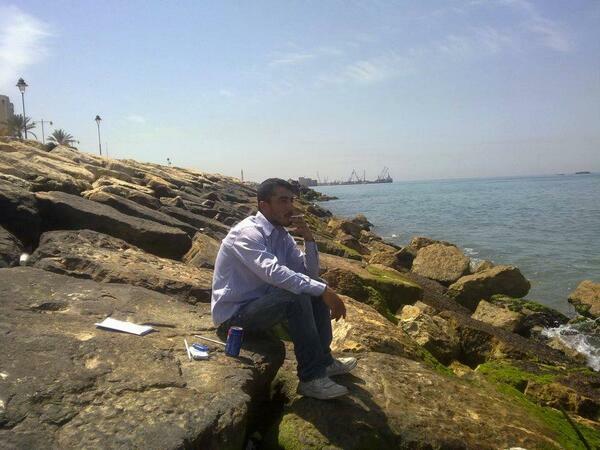 Shadi Jassim prior to his life as an ISIS suicide bomber. Photo reportedly in Beirut. According to a media representative for Dawn of Freedom (not in Kobani), Saraya Jarabulus is a very small independent faction. The Kata’ib Shams al-Shamal representative in Kobani subsequently clarified to me that Saraya Jarabulus was initially operating in the city but now it has no presence. 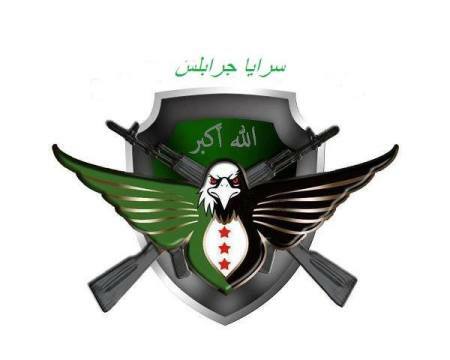 Jaysh al-Qasas is in origin a rebel faction from Deir az-Zor city, some of whose members took refuge with the YPG as IS(IS) gradually took over Deir az-Zor province, having consolidated its control over all rebel-held territories in the province (including within the city) by July of this year. 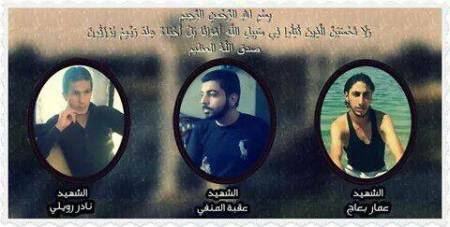 On 3 November, the group announced that three of its fighters had been killed in Kobani fighting IS. On a final note, one should comment on the initiative announced by Col. Abdul Jabbar al-Oqaidi [aka Abu Muhammad]- a one-time touted leader of the ‘FSA’ in Aleppo province- to send in 1300 ‘FSA’ fighters to Kobani to push back against IS. This gesture should be taken with a pinch of salt, partly rooted as it is in Oqaidi’s regret at having worked with and defended ISIS last year and partly in Oqaidi’s desire to make himself still look like a relevant rebel figure even as he spends the majority of his time in Turkey. There is indeed a contingent present in Kobani representing Oqaidi but its presence is symbolic. As a Kata’ib Shams al-Shamal representative put it to me, “Oqaidi’s group only eats and drinks.” As of now, Oqaidi’s small following remains the only external rebel contribution outside of Euphrates Volcano: claims that Islamic Front groups like Jaysh al-Islam were planning to send fighters to Kobani have proven unfounded. In short, an overview of the rebel factions operating in Kobani at the present time shows that YPG-rebel cooperation is still local and exceptional in nature, and does not point to a fundamental shift in the dynamics of the conflict. More generally, ultimately conflicting goals, widespread rebel dislike of the “Kurdish parties”-with suspicion of cooperation with the regime* and a separatist agenda to divide Syria- and the practicalities of being able to send fighters to Kobani (it can only be done via Turkey) inhibit notions of a wider, more coordinated YPG-rebel alliance for the foreseeable future. *- The very first airstrikes that were reported in the Kobani area by the Syrian Observatory for Human Rights were likely the work of the regime, whatever denials might come from PYD media. In light of the ineffectiveness of such airstrikes against IS, there was a turn to the international coalition for help. It would appear that the PYD had initially reached out to the regime via Muqawama Suriya leader Mihrac Ural (hat-tip: Ceng Sagnic)- an unsurprising intermediary choice (if we go with Ural’s testimony on 20 September), as Ural had facilitated contacts between Hafez al-Assad and the PKK. Despite Ural’s apparent negative feelings about the PYD’s autonomous administration project that has come at the expense of regime authority in areas like Qamishli city, he has been keen to portray himself as a figure standing in solidarity with Kurds against the IS threat. اليس فلاديمير هو اجدر لنشر مواضيع حول عين العرب؟ ببساطة الموقع . بات سخيفا! I think this article from FP is much more pertinent. Once again Nir Rosen an Israeli is trying to save the regime in my view and this is because it has become clear that its ability to protect the border with Israel for the safety of Israel is no longer possible and that its control over the Palestinian refugees of Syria will also collapse and they will have a Hamas on the North side and another on the South side. I have said it many times break up the Sykes Picot garbage. It has built within it inherent eternal instability and strife. War has bankrupted empires for 2,500 years. America is no different. Especially when countries go into debt to finance the war … instead of paying for it out of current finances. I would like to post this UN study about the economic state of the glorious Syrian Arab Republic the heart and soul of the Resistance Movement and the Rock on which the fiendish schemes of world wide attack have shattered. This economy is back at least 30 years. The government buys only food and weapons and were it not for the Iranian line of credit of 4.6 billion all will collapse in two seconds. With the advantage of another year of following through with whatever happens in Syria, one can notice that the conclusions drawn in the article were both hasty and flawed. The even then present american bombings were clearly not factored in correctly. The alliance between the small arab factions and the YPG has evolved in the SDF and small arab factions are joining the SDF. Kobani did not fall and the canton of kobani joined Jazira canton after the taking of tell abyad.